At least in the early part of the season, “Sunday Night Football” usually features one of the most highly anticipated matchups of each NFL Sunday. Last week’s contest between the Oakland Raiders and Washington Redskins also had plenty of interest. The Indianapolis Colts visit the Seattle Seahawks in what could be one of the worst primetime contests of the entire 2017 NFL season. New Orleans quarterback Drew Brees says the team will kneel and then stand for the national anthem before their game against Miami in London. Brees says in a tweet on Friday, "As a way to show respect to all, our #Saints team will kneel in solidarity prior to the national anthem & stand together during the anthem." That&apos;s also how the Dallas Cowboys dealt with their anthem protest on Monday night in a game against the New York Giants. 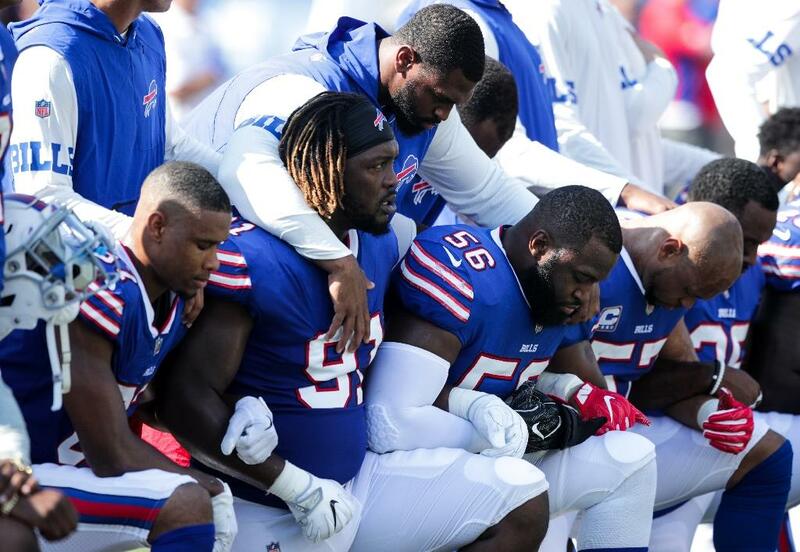 Ten Saints players sat on the bench during the anthem last Sunday on a day of unprecedented protests among NFL players and some owners in response to comments by President Donald Trump that players should be fired if anyone "disrespects our flag." Can Eli Manning keep his recent fantasy success rolling in Week 4? Yahoo Fanalyst, Liz Loza thinks it’s a possibility. To review… all of these players are owned in less than sixty percent of Yahoo leagues (at time of writing) and/or are a significant value in our daily game. NFL owners met with commissioner Roger Goodell and a handful of players for several hours prior to the league&apos;s Thursday night game in Green Bay where patriotism was substituted for protests. Players and coaches from both the Packers and the Chicago Bears linked arms during the pre-game anthem on Thursday as a show of unity but no one appeared to take a knee or raise a clenched fist as they had done in the past. The Packers had asked their fans to also link arms in unity during the playing of "The Star-Spangled Banner" and while some small groups obliged, the majority of the crowd either held a hand over their heart, stood at attention and saluted or waved small American flags. Mike Evans wants no part of a debate about whether he or Odell Beckham, Jr., is the best young receiver in the NFL. Both are in the discussion, and that&apos;s good enough for Tampa Bay&apos;s emerging star, who faces Beckham&apos;s New York Giants on Sunday. The fourth-year pros are among the most productive players since entering the league as part of a stellar group of rookie receivers selected in the 2014 draft with 553 catches for 7,975 yards and 65 touchdowns between them. NFL Commissioner Roger Goodell held a round-table meeting with roughly 25 owners, league executives and players on Tuesday night to discuss the national anthem demonstrations. New York Giants linebacker Jonathan Casillas said the summit at the league&apos;s headquarters in New York lasted roughly two hours and was attended by several of the NFL&apos;s most prominent owners, including John Mara of the Giants, Robert Kraft of the Patriots and Art Rooney II of the Steelers. The self-proclaimed &apos;&apos;Fight For LA&apos;&apos; is going poorly for the winless Los Angeles Chargers, who will be challenged by Philadelphia both on and off the field at their suburban soccer pitch on Sunday. First, the Eagles (2-1) have a successful rookie kicker, Jake Elliott, who boomed a 61-yard field goal - the longest in franchise history - as time expired to lift Philadelphia to a 27-24 victory against the New York Giants. The Chargers (0-3) have a rookie, kicker, too, Younghoe Koo, but he&apos;s off to a rough start.